Here at InterKnowlogy, we get time each week to tinker and dive into technologies that interest and inspire us. We call it RECESS, which stands for Research and Experimental Coding to Enhance Software Skills. This week I’ve been noticing sites ‘sprucing it up’ by using custom font embedding with services such as TypeKit (Or similarly related projects such as Google Web Fonts) that allow you to license and use custom fonts in a site. There’s a problem though. 90% of the time it annoys me. Let me explain. First impressions are everything, and right after first impressions is readability. If I come to your site looking for information, to read something, I don’t want to get a headache doing so. 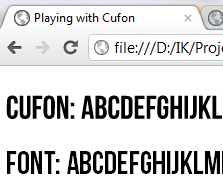 The problem isn’t the design or the font itself usually, it’s the way the browser deals with and renders the font. Using a custom or weird font for the body text of the page WILL bother people. Its why standard fonts exist and are as popular as they are: readability. Now, that being said, there are really good design reasons to want to use custom fonts in a dynamic content driven site to augment the design. Especially in the title and headers since it will catch someones eye and because people spend a minimal amount of time reading them anyways. Whatever the reason, if your going to go down the custom font path its going to be important to refine and choose a solution that is going to be consistent and usable for the people that visit your site. I was surprised at the results. 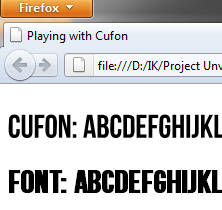 Same font, same file, but completely different results between Chrome / Firefox / Safari (IE9 excluded obviously) for the regular font rendering. Cufón came out the most consistent of all of these. The big thing to note is how jagged the letters look until you get to IE9. 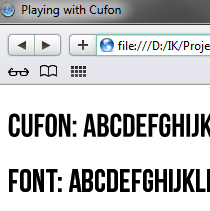 Readability wise, I would NOT consider using an alternate font for a large amount of text unless I had to, and for right now, Cufón seems a very viable choice for consistency. Be careful with your font choices and how far you take this on a site that will be used on a regular basis. Cheers!